Duc: Dude, where are my bytes! Duc is a collection of tools for inspecting and visualizing disk usage. Duc scales quite well, it has been tested on systems with more than 500 million files and several petabytes of storage. 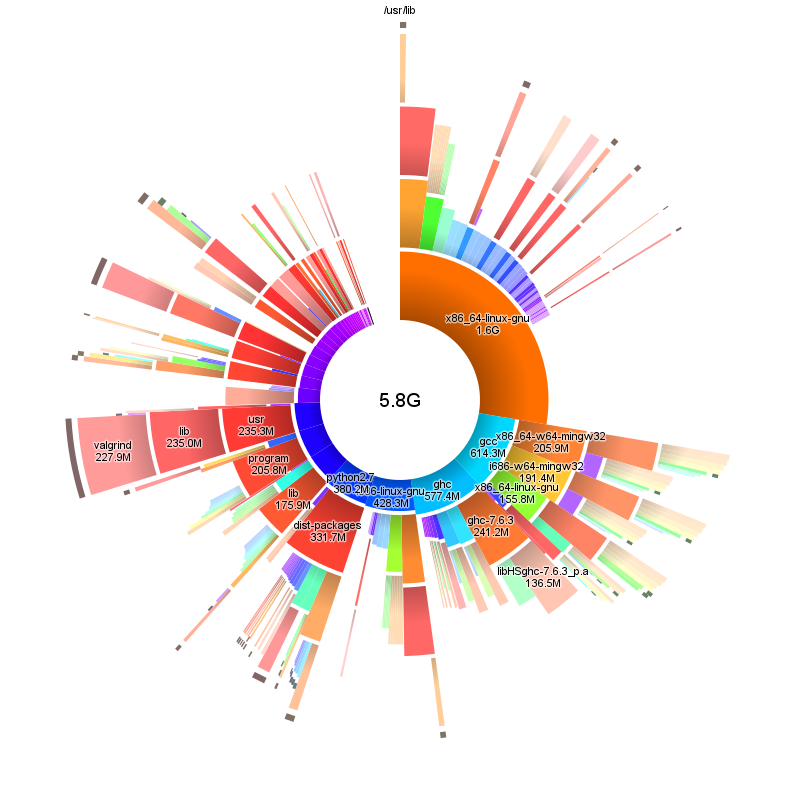 Duc is a collection of tools for indexing, inspecting and visualizing disk usage. Duc maintains a database of accumulated sizes of directories of the file system, and allows you to query this database with some tools, or create fancy graphs showing you where your bytes are. Duc is built to scale to huge filesystems: it will index and display hundreds of millions of files on petabytes of storage without problems. Duc stores the disk usage in a optimized database, resulting in a fast user interface. No wait times once the index is complete. Duc comes with a number of user interfaces for quering the database: use Duc on the console with a command line or ncurses interface, on graphical desktops with an X or OpenGL GUI, or over the web using the CGI interface. 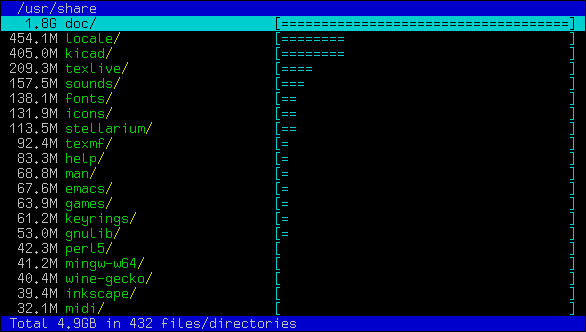 Duc comes with a command line tool called duc, which is used to create, maintain and query the disk usage database. run duc help to get a list of available commands. duc help describes the usage of a specific subcommand. Extensive documentation is available in the manual page man page. For more detailed installation instructions and a description of all the relevant ./configure options check out the INSTALL file at the GitHub repository.